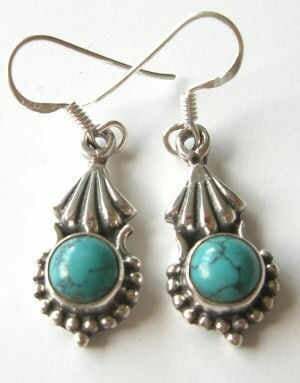 Gorgeous natural Turquoise stone earrings set in amazing silver. These earrings are a made up of a lovely lovely 8mm dia blue turquoise stone with beautiful natural grey veining. The Blue turquoise is a lovely stone, an never ending favourite. These earrings come in a free velvet pouch.